Wilson's current harness is not one of the two. I would like to get him a safer one. I was just wondering if anyone has tried either of these two? If so, do they fit whippets well, and what size did you use? Looks like both are going to be a pain to get to New Zealand (story of my life) but the Sleepypod might be easier. My Sisters got the ClikIt harness in their Christmas stocking (after reading about that test here on WW), in a size small. Their web site shows how to measure (around chest and between base of neck and shoulders), and the one I ordered fits my petite girls just fine. It is a little complicated to get it set up at first--you have to find the baby seat restraints hidden in the back seat and then configure the harness--but it does seem comfortable for them and like they are more "restrained" than their prior harnesses. Chai normally travels in a crate, but there are times when a seat belt would be a bit easier. Do you have any photos of your girls wearing theirs? I will try to take one next time we're in the car. I don't quite understand why, in the report, it says that dogs object to wearing a harness, mine have worn harnesses in the car ever since they became available and I've never had a problem with it. I still use my original one bought over twenty years ago with the seat belt loop stitched to the harness, not relying on a metal clip like a newer one I bought for Aida. I wasn't too sure about the test accident either, one dog flew through to the front of the car but only because there was nothing in the way to stop it, it looked as though they had removed the passenger seat. No way could a dog have been thrown between a seat and the car door! They also didn't fasten the strap short enough to prevent the dog from hitting the dash, which really defeats the whole purpose of wearing the belt. My whippets were fine wearing the belt, and Tessa prefers it to the crate, if it means that she gets to ride shotgun. Here's Chloe showing the strap fastened slightly too long. The seat was removed because in one of the test crashes the test dog damaged it beyond repair, but they were still able to accurately measure travel velocity etc. I used to drive around in blissful ignorance with our mini dachshund lying on the parcel shelf in the back of the car. Everyone thought it was cute, no one thought twice about it. It was when Chelsea was just over a year old that things finally hit home with us with three things happening pretty close together. There was an article about an Irish Setter who killed his owner by flying into her from behind in a rear end shunt. A well known US whippet person was in a car accident where he was in hospital for weeks, and his whippet was killed (he usually used a crate, but the rental car wasn't big enough), and Chelsea started to 'surf' (she would stand with her back feet on the back seat and front legs on the console between the front seats) and I worried what would happen to her if I hit the brakes. We went straight out and got a seatbelt that day (no room in the car for a crate) and we've used seatbelts or crates since. Just my .02 for what it's worth. Carol, the comment about dogs resisting car restraints had me rolling my eyes, too. It's the head of our SPCA saying that, almost sounds like he's trying to talk people out of it. His dog is probably loose in the car. Wilson also never resisted his car harness, to him it's no different than a collar, it's just what he wears in the car. This must be playing on my mind because a couple of nights ago I woke up in a panic. I'd had a bad dream that I'd bought a Sleepypod harness for a bus trip, but instead of using it I'd decided to keep Wilson in my suitcase. Got off at my stop and left my bag on there, and spent the rest of the dream frantically trying to find Wilson! Oh, no, Hannah, that's a terrible dream about leaving Wilson in your suitcase on the bus and then frantically trying to find him! Some dreams really upset you, don't they? "At the end of the day people have to decide what's best and safest in their circumstances based on the information to hand. It drives me crazy that one of my closest friends (currently in training to become an APDT trainer) just has her dogs loose in the back/boot area of her hatchback. But you can only say so much "
I am just in the process of having a custom built cage made to fit behind the back seats of my Polo hatchback to keep Chancey safe. It probably won't cost too much more than separate backseat guard & a tailgate guard from someone like Barjo. Ho is that Chancey doing Carol? Thanks for asking, Jini, she's settled down in the back of the car OK on the few times I've taken them out. Once the cage is fitted I'll feel happier about driving with them. Thank you for all of the information in this thread. 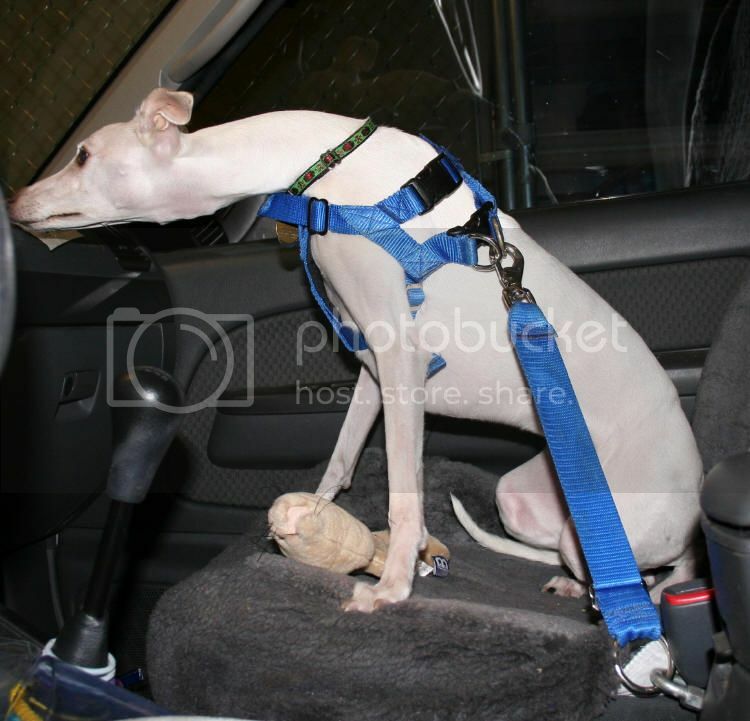 I would still love to see the harness on a whippet as I am considering one for Chai. I have a crate for her in my car, but ryan takes the crate out of his car from time to time. A harness would make things easier, but I always preferred crates due to the safety benefits. These options do make me feel more comfortable using a harness. I have a crate for mine, they all go in together but it stops them flying out through broken glass or over seats and becoming projectiles. I had a harness that was apparently crash tested, I will try and remember the name. The Whippets had no issues with them. I love the one I got for my whippet Ranger. It took a little trial and error on the adjustment but it was no where near as difficult as some of the reviews make it out to be. I recently heard they are coming out with a new design soon called a clickit sport and I will be getting one for my whippet puppy Gus just as soon as he stops growing and I can get an accurate measurement. Do you know how the Clickit Sport will differ from their current harness? Glad that we will soon have additional safe options. I have been using a seatbelt harness with Chai for the past few months and am very happy with this system for us for short, daily trips. The Click-it/Sleepy Pod uses two very sturdy attachment hooks for the rear seat child seat attachments (under the back seat), instead of the single hook to the seat belt harness like their prior car harnesses. It attaches at two points on each side, through two rings that are just above the place where the collar-like clip comes together, so they are really anchored in four spots. Their old harness just attached at the back through a single ring. The rear attachment is only about 8-10" long, so my girls are more comfortable lying down (although they can sit up). There are a couple of YouTube videos that show how to hook it up--that was the only part that was hard--and also give a good perspective for how it looks. I'm sure that restricting the amount of movement by having short restraints and not hooking them to the seatbelt--which can also move bit--helps explain the good safety rating. It takes about another minute to get them ready to go (the two large hooks in four smaller rings compared to the one hook In one ring of the prior harness), and it took a couple of trips before they got used to not being able to move around so much, but making the change really wasn't a big deal. I know this post has died in a while, but I was wondering about getting 2 sleepypod Sports for my whippets. Does anyone have and can show some photos, if it fits? Because there are no in my country, so I'll have to order from Germany (I'm from Portugal). They're super expensive, and I want to be sure that they fit properly, and work properly. Anyone you know with sighthounds has use this harness, and proven to work? However, it's the only "safe" harness, proven to work at 30mph, (which is not much, I mostly drive in highways at speeds of 80 mph - but I've seens testemonials that worked for their dog (not whippets) at 60 mph for example), and my car does not fit 2 crates, only one crate. I travel twice a week at least, with my dogs, and I just want them safe. My female is 55-56cm just after the legs, around the chest and weights 11kg, "normal chest"
Please tell me if you have one, if it fits, photos, opinions, anything will be welcome! thanks!